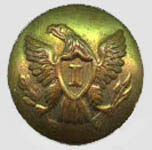 Buttons with an engle having an "I" on its shield for infantry were first used in 1821 and passed from use in 1902. There are changes in style of construction that allow dating to period. 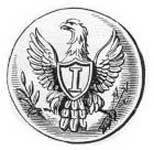 During the Civil War they were brass and generally have the name of the manufacturer or military outfitter impressed on the back of the button. A round wire shank was used to attach the button to the uniform. A larger sized button was used on coats and overcoats and a smaller size on cuffs, sides of caps, vests, and epaulettes. The Backmark on the original button is "HORSTMANN'S NY & PHI."